Jane Hallworth approaches design as a synthesis of architecture, decoration and landscape, all intimately tied to the unique spirit of each client. Her work is narrative-driven and intensely collaborative. Each project has its own story to tell—a story articulated through the creativity of a diverse team of designers, craftsmen, artists, and fabricators. Rather than enforcing a signature design aesthetic, Hallworth prefers to let the singular style of every home emerge from the substance of its conception. A native of England, Hallworth opened her interior design practice in Los Angeles in 2000 after receiving undergraduate and graduate degrees in architecture. She soon developed a loyal following among actors and other creative talents who share her passion for storytelling through design. At the same time, she has cultivated a reputation for her distinctive curatorial eye, helping clients assemble serious collections of decorative arts based on beauty, pedigree and value rather than superficial style or trendiness. Equally fluent in traditional and contemporary design languages, Hallworth has collaborated with a broad range of architects, including Howard Backen, Mark Rios, Marc Appleton, Candace Miller and Scott Mitchell. She has also restored many historic homes by the likes of Paul Williams, A. Quincy Jones, Paul Laszlo, George Washington Smith and Lloyd Wright. The through-line for these far-flung projects is her belief that suitability always overrules fashion. That’s the Jane Hallworth story. What’s yours? The aesthetic narrative of this sophisticated entertainment pavilion begins with architect Wallace Frost’s legendary 1930s estate, known as “The Villa.” After years of living in Italy, Frost imported classical Italian architectural language to the luscious Santa Barbara hills. In 2001, architectural and interior design icon John Saladino saved the estate from near ruin, reverentially restoring the 17th century style structure to its current glory. Following our clients' acquisition of “The Villa” and two bordering properties, they commissioned a vast games house to grant every luxury and whim. Backen, Gillam & Kroeger Architects were enlisted to plan the ground-up project; Hallworth was appointed to shape the creative direction and spearhead this remarkable architectural collaboration. Our building, Jordan Hall, serves as the social epicenter of the newly expanded estate and evolved in the same spirit as the original: a building carved into the hillside, affording an entirely new vista of the Pacific Ocean among the canopies of eucalyptus and olive trees. The fanciful nature of Jordan Hall’s origins necessitated that the main house be the conceptual mooring of this addition. We conceived it as a temple that lay in ruins, restored and added to over time. The central building is clad in stone hewn out of the site itself. Secondary spaces are fitted with salvaged corrugated tin, marking them on a material level as having been appended to the primary space. Neoclassical details pay subtle homage to “The Villa.” At the heart of the main gallery is an eight-ton boulder excavated from the property. This became the building’s anchor as a fireplace hearth and informed our design of a monolithic bar sliced of stone, as if a boulder, deconstructed. Massive metal doors and windows designed by BGK Architects slide back to reveal panoramic views of the ocean and acres of land minimally landscaped by the visionary Barbara Nimmo, who has been custodian of the estate for several decades. The ocean-side lap pool cuts the hillside like the prow of a ship at right angles, creating a central axis through the building. Like a telescope, apertures along this axis contract toward the mountains, revealing patios and outdoor kitchen areas embedded into the slope. Jordan Hall is an emotional space – an exquisite study of materials and finishes. A piece of jewelry hidden in the hills of the Santa Barbara coast. Our client had a very specific vision for this 1940s Monterey Colonial-style estate. Her brief: an environment that embodied glamorous Zen, which inherently implied an impossible dichotomy. The ground-up renovation of a 7,000 square-foot home and additional 2,000 square-feet of entertainment space was entirely informed by her love of all things organic, substantive and life-affirming. This home tells a story in which every part is meaningful. In practice, this resulted in an assemblage of an extraordinarily rare and idiosyncratic collection of decorative-arts, lighting and furniture against the backdrop of Santa Monica Canyon’s romantic, sweeping views. Immediately upon entering, one is confronted with a staircase reimagined to fit bronze floral panels designed by Émile-Jacques Ruhlmann and fabricated by Edgar Brandt in 1925 for Paris’ Au Bon Marche department store. A Tord Boontje crystal blossom chandelier descends from a light aperture, seemingly suspended in the sky – a branch pulled by a vortex into a turbine. Together, these elements exemplify the symbolism of natural beauty, its growth and renewal – our solution to the client’s brief and a universal theme examined throughout the entire residence. The development of this artist’s retreat was a proper collaboration between architect, client and designer. The client, a painter, saw the potential of one of the last sites in Aspen with unobstructed views of the basin and the North Star Preserve. Perched on the hillside, the house has a cliff-like design that informed the interior elements. With no other homes in sight, the surrounding rugged terrain and vistas have a painting-like quality. This quest for authenticity was the directive for our scheme. We were inspired by mechanization, particularly antique farm machinery, as a method of rooting the interior design in a language that allowed us to explore a modern aesthetic within the context of a rustic vernacular. This is most evident in the kitchen. A stone grappling hook grips the island as if to hoist it away. The range, clad in blackened steel, is the heart and hearth of the home, and a pair of light fixtures procured from Bauhaus factories, make a subtle industrial statement. In juxtaposition to this design ethos, interior finishes and furniture are simple yet luxurious. A restrained palette of white plaster walls, vintage-washed linens and tobacco antique leather all patina over time and relax with use. Minimally and purposefully furnished in a mix of classic mid-century, industrial and primitive pieces, this space is the antithesis of a traditional Aspen residence. It is contemporary and elemental, clean, tactile and warm. This retreat is equally engaging in summer’s green and winter’s white. A developer acquired this iconic Holmby Hills home from the estate of Mrs. Brody and in the process of building, completely reworked the interior of an original A. Quincy Jones/Billy Haines collaboration. In turn, we set about restoring the architecture and interior palette back to an homage of earlier iterations under the auspices of these two design masters. 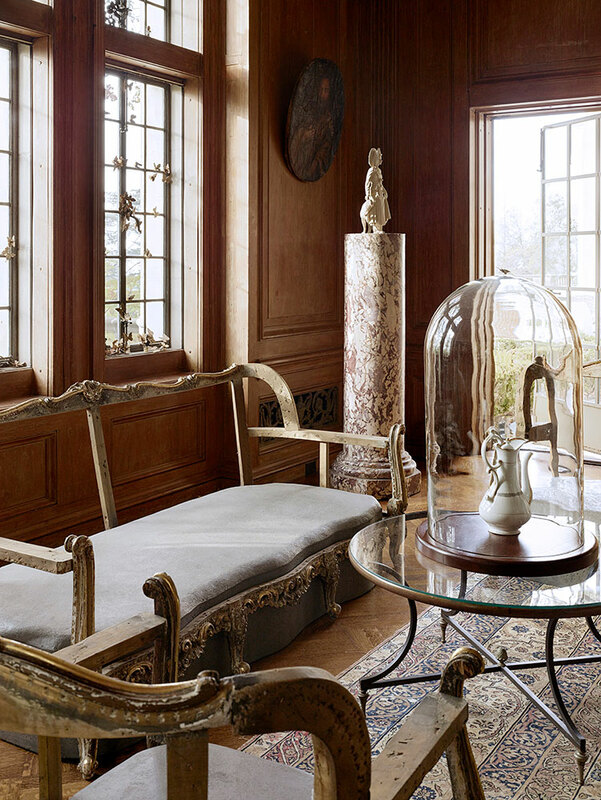 Together, with an exacting client, we curated a furniture collection that would befit one of the most prestigious houses in Los Angeles without trying to pastiche or erode the original design intentions. The furniture plan is a close replica of Haines’ earliest incarnation of the home, with earthier, more organic modernist furniture and an emphasis on architecturally-designed French pieces from the same period as the house. Custom lighting for the project produced by our firm was also in part influenced by Haines’s original lighting still in residence. Our celestial-based light fixtures compliment and add to his narrative and appropriately feel as if they have always been part of the fabric of the house. Built in the 1970s from a House and Garden catalogue plan run amuck, every window and door was salvaged by the eccentric Dutch builder who transformed the Colonial drawings into a mock-Tudor using antique parts. The resulting building is haphazardly charming, with salvaged windows and beams throughout, and immediately brought Nordic lake houses to mind. This rough-hewn 2500 square-foot wooden cabin was transformed into exactly that, with 60 gallons of arctic white paint and the owner’s eclectic furniture collection. Every effort was made not to erode the fancifulness of his ambitions – the interiors are light, airy and delicately ornamented. A deft reliance on negative space showcases the Scandinavian charm of this joyfully rustic retreat. Tucked into a hillside above Hollywood Boulevard in the acclaimed Whitley Heights, sits an international style gem built in the 1930s, designed by the esteemed Hungarian architect Paul Laszlo. The deliberately strong palette and mechanically simple detailing were employed to reinforce both Laszlo’s uncharacteristically masculine, subtle architecture and counter the client’s ever-evolving, exquisite but often lavish furniture and art collection. Greige-lacquered walls, blackened cerused wood floors, Etruscan mosaics, black walnut and bronze cabinetry, and subtle, cinematic lighting align to illustrate the Metropolis-inspired palette developed for this full-architectural renovation. After World War II, Spartan Aircraft turned its design expertise and building techniques mastered in war plane production to the art of domestic travel. With Art Deco details, such as compound curved glass and ribbed aluminum paneling, Spartan Trailers channeled the spirit of aeronautics and represented the epitome of chic, luxury travel. As the daughter of an aircraft designer tutored at every plane, train and automobile show, Jane Hallworth was naturally drawn to the challenge of a chassis-up renovation of a 1950s leviathan. 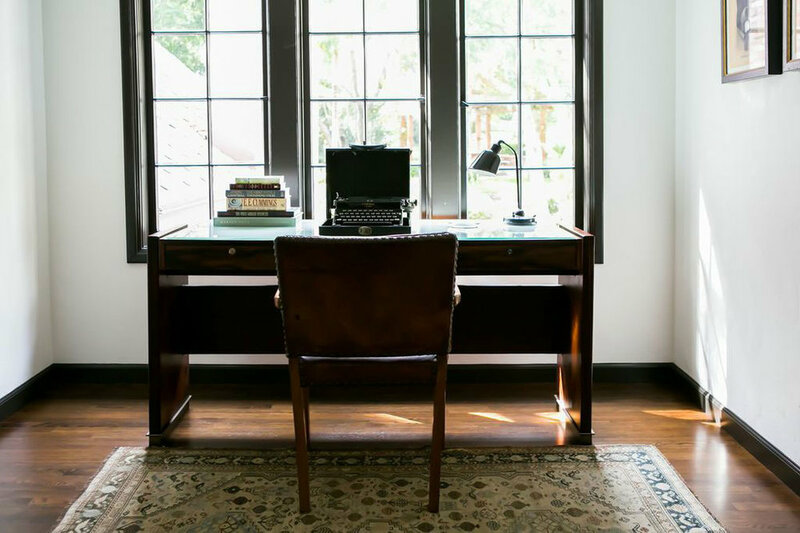 Named after both her father and a Northern English colloquialism for a sharp-dressed man, Bobby Dazzler was conceived as a “home away from home” for our clients who are frequently on location. Trailers are a study in intimacy and absolutes, necessity over ornamentation, human scale over grand gesture. Drawing inspiration from the decadent interiors of 1940s and 50s yachts, such as Christina O., the furniture is primarily built-in; what isn’t built-in is versatile and maneuverable. The fit-out primarily focused on achieving grandeur and subtle opulence through luxurious materials. 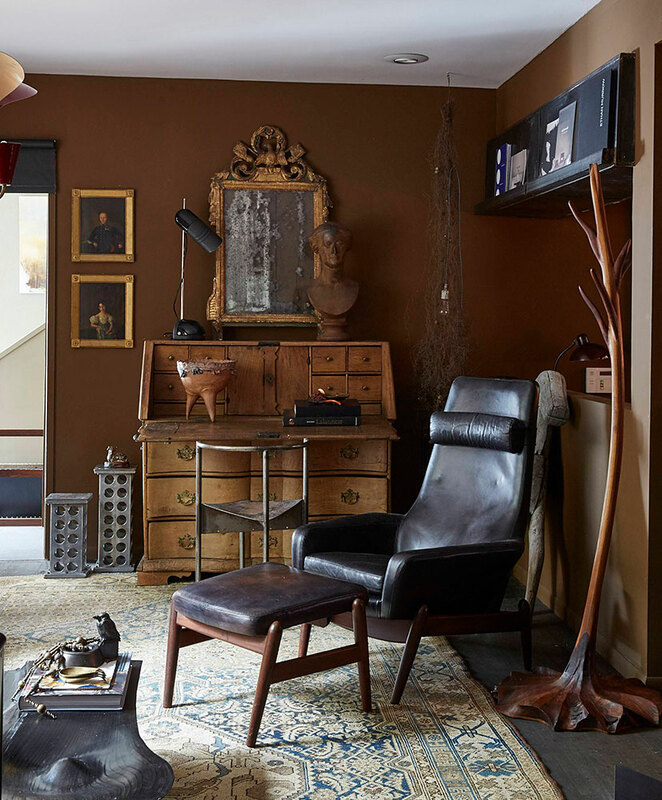 Notable features include case-pieces fashioned from reclaimed rosewood panels found in an abandoned luthier’s warehouse, leather floors, antique Adnet furniture, and textiles that are durable yet tactile and soft. In such a space, all elements need to age with patina and grace, evoking a sense of home, transported. Call for bookings, sales and design. A luxuriously layered modernist apartment on the 25th floor of a Los Angeles tower is the home of an enviable art and furniture collection. The impressive 240-degree views of the ocean and downtown command attention in equal parts with Basquiat and Kapoor. While the furniture is functional art, its main focus is livability, and its arrangement is an invitation to relax. Daybeds placed in advantageous areas provide an escape and sanctuary. White oak walls and floors are organic and simple, offering a naturally soft backdrop to this collection of 20th century masters. A cinematic color palette of olive green distemper is the interior version of a camera obscura; moody hues urge one to focus attention on a world beyond – city lights and formidable views –before turning your attention to the crafted interior. Designed specifically for entertaining, this space is intimate during the day and dashing at night. 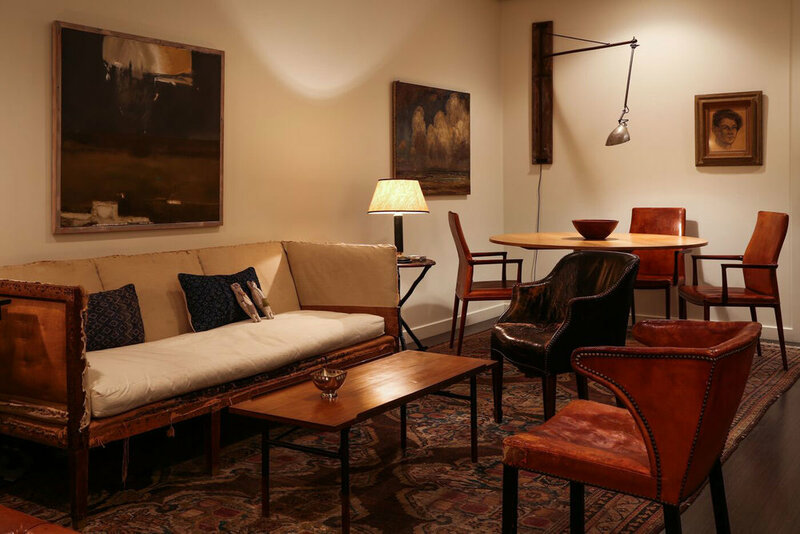 In this 4,000 square foot space, a gathering of people and fine art by masters such as Louis Bourgeois, Mark Grotjahn and Jean Dubuffet mix well in purposefully rustic, modern comfort. A layered collection of textured textiles, industrial, antique and modern pieces contrast the sleek lines of this penthouse, creating an environment that is at once studious and negligently glamorous.